Established over 15 years, Pharmtech is the pharmaceutical industry's annual meeting place, where the latest products, technologies and techniques for pharmaceutical production are on display, and established names in the industry both in Russia and abroad can meet pharmaceutical producers from Russia and Central Asia. As the only show dedicated to this important industry in Russia and CIS, Pharmtech brought 2013 together ~ 400 exhibitors from 31 countries. Visitors to the event gain invaluable information about the pharmaceutical industry in Russia, which will help them to build their businesses and improve the quality of pharmaceuticals in Russia. Asahi Kasei Bioprocess Europe exhibited for the first time on this valuable event. This is an important step towards in the promotion of our products in Russia and CIS countries and also additional step towards expansion of our global technical support and customer service in this region. In Moscow we got the chance to meet many of our existing and potential customers from different countries interested in Planova™ virus removal technology and Bioprocess Equipment products. We consider the Russian and CIS market as very interesting one with a lot of potential and also we look forward in the future to be closer to our customers and to serve them faster and more effectively. 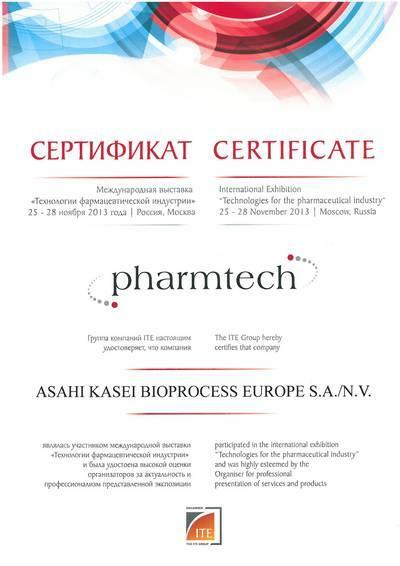 Additional information regarding our participation in Pharmtech 2014 which will be held on November 25 - 28, 2014 in Moscow will follow.